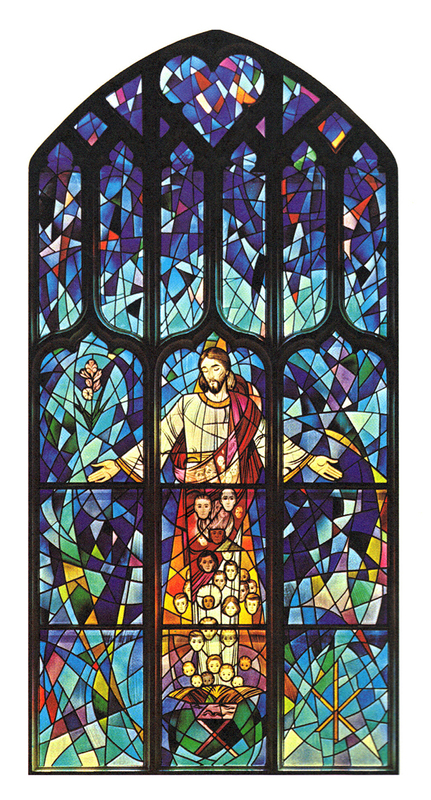 The windows of Lakewood Presbyterian Church are done in the mosaic approach. Where a change of color is wanted, a different piece of glass is used. The glass itself is called antique since it is made by the method used during the middle ages. This method produces the refraction of light seen in the windows. The glass is hand blown and comes from France and Germany. The glass slabs used for the faceted window on the balcony came from the Blenko Glass Company of West Virginia. The construction of this window differs from all the others. It is made of cast glass chipped and cut to fit the artist’s design and laid out in large frames set in concrete. 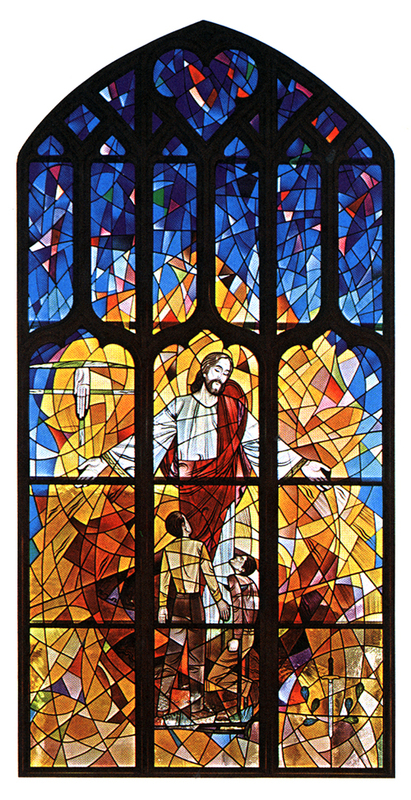 The designs of these windows are unique for Lakewood Presbyterian Church in their interpretation and significance and are truly works of art never to be duplicated. With a burst of color, the Creation Window suggests the awesome power of God, the Father. The universe, of which earth is only a part, was created by Him who is omnipotent. In the center of the window in capsule form are symbols representing the Creation, the sun and the moon, the stars and the planets, the blue waters of the seas, the animal life and the green vegetation of the earth. 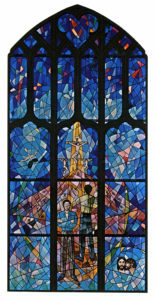 Extending across the three panels of the window is the eye of God and from the pupil which suggests the globe of the world, rise the figures of a man and a woman made in His image. The faces are those of maturity, exemplifying not the paradise found in the Garden of Eden, but the realities of life in an earthly world. The dove descending from above represents the Holy Spirit whose divine creativity brought forth a universe and whose divine inspiration sparks the creativity in man as he seeks to explore and endeavors to understand that which surrounds him. Red, the color associated with the Holy Spirit, dominates the window. The Creator’s star, an Old Testament symbol, is seen in the upper right-hand corner, and the triangle, representing the Trinity and enclosing the two Hebrew “Yods” signifying the name of God, is found in the lower left-hand corner. 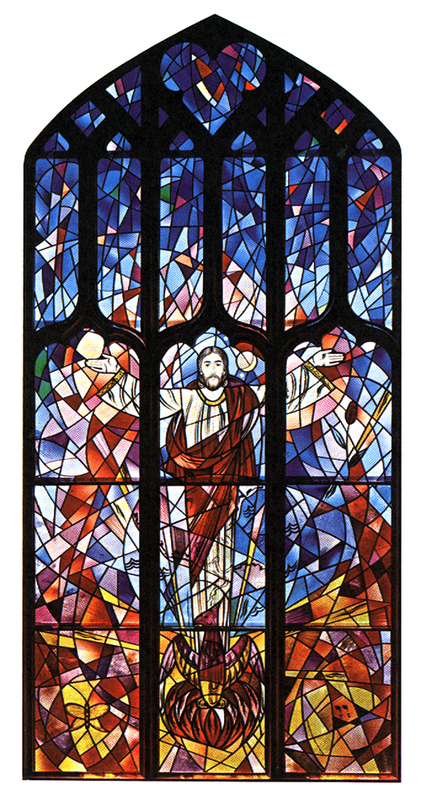 Christ, looking down with arms outstretched, is the dominant figure in the Incarnation Window. At the foot of the window is the manger, the symbol of Christ’s birth among men, set upon the prophetic cross. From the manger rising up within the folds of Christ’s robes are the faces of all humanity, faces of all ages and all races, portraying man’s kinship with God through Jesus Christ and God’s encompassing love for mankind. Behind one of the faces is the suggestion of a clock, representing time. The basic color of the window is blue, for blue represents truth, faithfulness and constancy, as well as heaven. 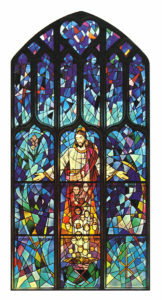 Two other symbols appear in the window, the gladiolus in the upper left-hand panel and the Christian symbol, the Chi Rho, in the lower right-hand panel. The gladiolus has historically represented the Incarnation, “The Word made flesh.” The Chi Rho, a monogram made up of the first two letters of the Greek word meaning “Christ,” was a symbol used by the early Christians. The Trinity of God is one of the fundamental beliefs of the Christian faith. 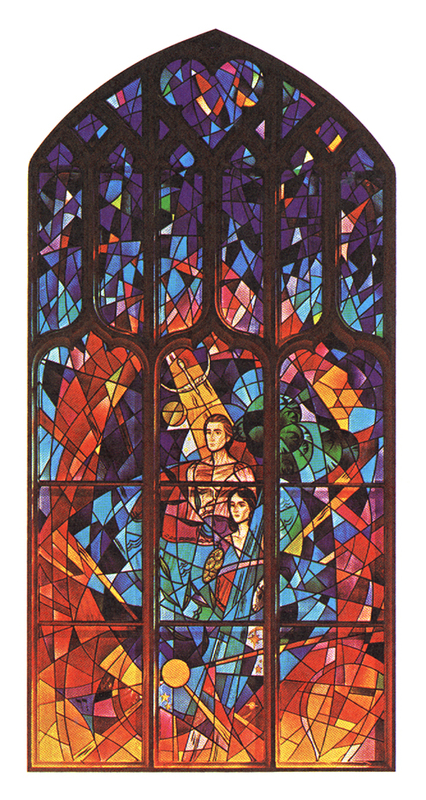 The first three windows on the east wall of the sanctuary portray the three-sided nature of God: God the Father, as in the Creation Window, God the Son, as in the Incarnation Window, and God the Holy Spirit, as in this, the third of the trilogy, the Window of the Holy Spirit. The most significant characteristic of this window is its color. Green is the symbol of life and growth, of hope and immortality and has long been associated with the Trinity. 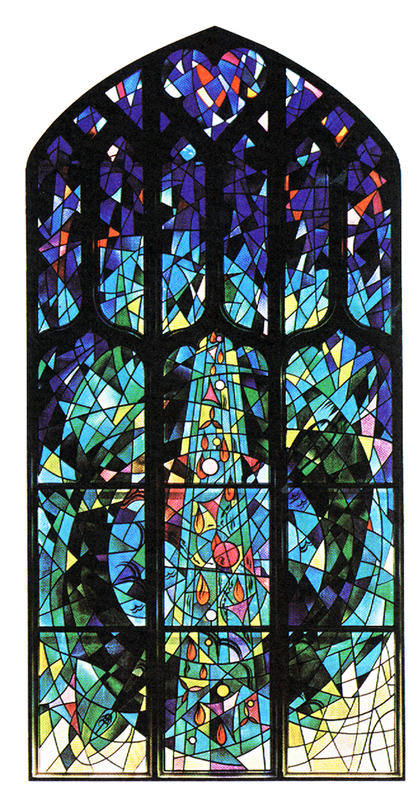 The globe of the world is in the center of the window, and coming down from above is a shaft of light covering the earth and going beyond to encircle all creation. Within the rays are many colorful representations of the Holy Spirit, circles, triangles, and tongues of flame. 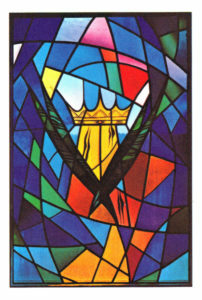 Hidden within the framework of the window, descending from the upper right-hand corner to the lower left-hand corner is the figure of a dove, the age-old symbol of the Holy Spirit. The wings of the dove extend to the opposite corners of the window, thus covering the entire design and reminding us that the power of God which envelops all creation is always with us. 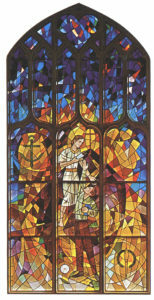 A youthful Christ and a young man form the center of interest in the golden glow of the Youth Window. The youth’s whole body is straining upward, his arms raised, his hand open, toward that faith to be found in Jesus Christ. Christ is bending toward the young man, offering to him in the gift of the scrolls, the divine wisdom and the guidance which will sustain his life in Christianity. The thrust of the man’s body and the responsive love of Christ depict the affinity between youth and Christ. Above and to the right of the head of Christ is the cross, the sign of the inevitable path which He must follow and the path which man must pursue in his struggle to live a Christian life. To the left of Christ is the anchor, the symbol of God’s steadfast love upon which the soul of every man may rest. The daisy at the foot of the window represents the innocence of the Holy Child, while the torch and the chains picture the torch of knowledge breaking the chains of ignorance. The colors are predominantly gold, yellow, and orange which suggests the warmth of life and mean in the symbolism of color, goodness, glory, and divine worship. The windows symbolizing the eight Beatitudes are blue in tone. The first three are portrayed in the large window on the east wall of the balcony. 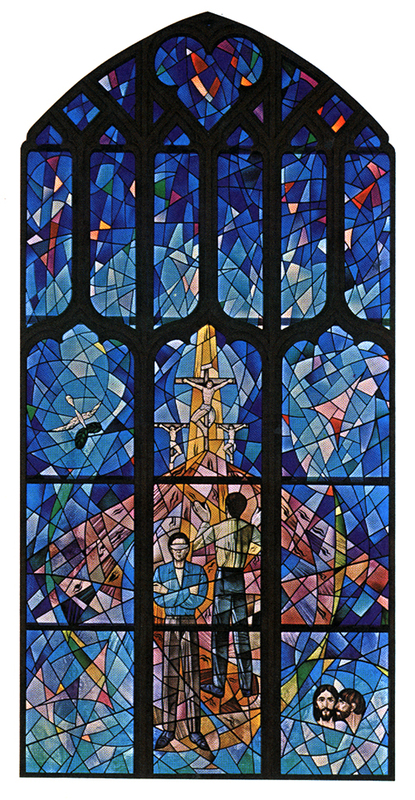 The Redemption Window is in the balcony facing Detroit Avenue. The faceted glass window is designed to have its greatest impact from the exterior at a distance. 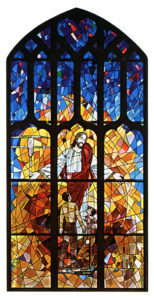 “The Invitational Christ” is the theme of the window. The designs are simple with alternating rhythms rising upward. 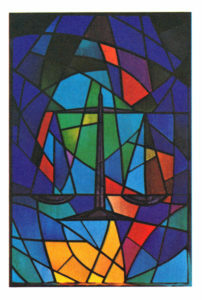 It is framed in deep blues signifying reverence and truth, with colors becoming lighter and richer toward the center. The heroic central figure welcomes a family group kneeling in adoration and devotion at His feet. Between the figures is a globe representing the world with a Chi Rho (X P) springing from its center and extending upward. “X P,” the first two letters in the Greek word for Christ, is the oldest monogram used with reference to the Redeemer. Behind the head of Christ is a golden aureole, symbolizing our Lord in glory. Through this and behind the figure is a large cross. The color is violet, signifying the Cross of Atonement. A dove, symbol of the Holy Spirit, is in the upper corner, a witness to God’s presence. Peace of mind and physical healing are poignantly portrayed in the Window of Healing, ablaze with hues of yellow, gold, and orange. These warm colors suggest goodness, glory, and wisdom. Christ is the dominant figure. The descending rays from His hands symbolize the healing of body and mind. The man in the left foreground has been cured, his dropped crutch forming the base of the window. With compassion, Christ looks upon the one who remains crippled. “I love you too, my son,” Christ seems to say. The lame man looks up to the Master for strength and courage. In the lower right corner are the sword and oak leaves, symbolic of fortitude, so vital for the endurance of suffering. God’s hand, the source of all protection and healing, appears in the upper left corner. This window is a constant and dramatic reminder to the burdened, the sick, and the incurable, that God in His boundless love will never forsake them. Basically, the color of the Gethsemane Window is green, the symbol of life, of hope, of immortality. Green is the color of fertility and of growth. In the lower left-hand corner a disc harrow is being drawn across a huge spider’s web. The web symbolizes man’s involvement in the circumstances of life. The disc harrow prepares the earth for growth and new life. Although man is caught in the web, there is that which opens the possibilities of growth and of new life. In the upper right-hand corner is the cross, the events of which were foreshadowed by the agony in the garden. The cross would not have been endured by Jesus were it not for His prayer and His commitment to the will of God. The figure of Christ is deep in prayer, looking up to God. The great scene depicted here links Jesus to the “web” of our humanity more than any other, with the exception of the crucifixion itself. The figure of the man parallels the feeling and position of the Christ. The artist has caught the turmoil of modern man as he prays to God. His face and hands show stress and strain. Here is portrayed the struggle of real prayer to find and accept the will of God. There were three crosses on the hill of Calvary that terrible day. 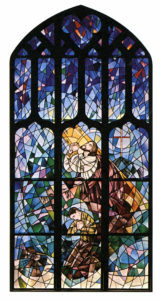 This scene is captured in the Crucifixion Window. Christ’s cross looms larger and more significant, but the other two crosses are reminders that humanity too was present, not only in Christ, but in the two thieves. Hovering in the upper left-hand corner is a dove with the olive branch in its beak. This refers to the story of the flood recorded in Genesis 8, and symbolizes the deluge, victory, and an expectation of new life. Here the dove is also a symbol of forgiveness—forgiveness which the penitent thief experienced. Two men of the present stand at the foot of the cross. One, with eyes covered and arms folded in defiance, is blind to the significance of the Cross and will not permit himself to see this truth, the saving love of God at work in Christ. The other man, with his hands outstretched, is following the path toward the Cross of Christ. Here is the promise that there will be some who will accept the saving love of God seen in Christ’s sacrificial death. The final events of the Crucifixion began with Judas’ kiss of betrayal, portrayed in the lower right section. The basic color of the Crucifixion Window is blue, the symbol of heaven, truth, faithfulness, and constancy. 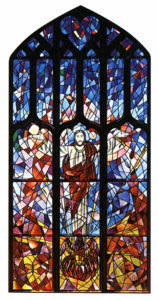 The Resurrection Window captures this power in picture, in color, and in symbol. 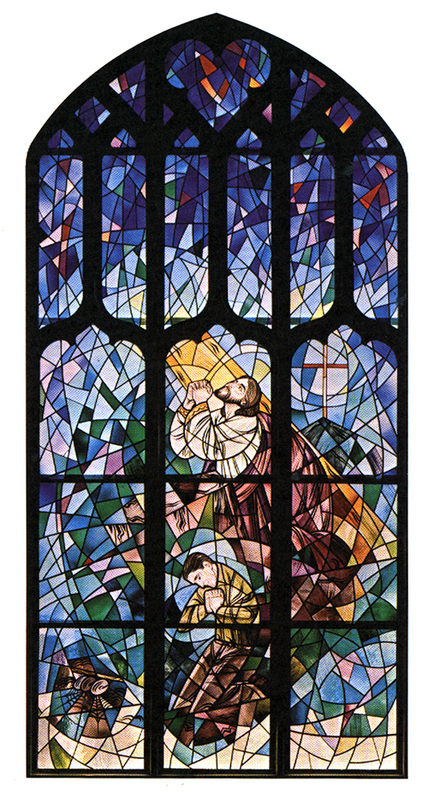 It is a companion theme to the Creation Window, since the resurrection is considered the re-creation. Both windows have tremendous bursts of color with brilliant red back­grounds. Red is the color of love, fervor, the Holy Spirit, the Incarnation, and the Church. As in the Creation Window, the eye of God extends to the edges of this window and the pupil of the eye is the earth. This signifies that re-creation is manifested in all the universe and that God’s eye is always upon us.